JRs Restaurant is not a place to visit or eat. Where do I begin? Oh, yah, no air conditioning, hot muggy, and smelling of cigarette smoke. I asked the duty manager about it. “Oh, yeah the air conditioning doesn’t work.” She added a shrug and walked away. Jim ordered the house Cabernet Sauvignon. With the first sip, I knew he didn’t like it. His face scrunched, his eyes closed, and he uttered an ugh. I ordered a pasta dish with a side salad. About ten minutes later, the server brought two set ups and tossed them on the table without a word. The next step was to consume the food. My pasta and garlic cheese bread were unlike anything I had before. It tasted strange. Jim and I couldn’t get out of the place quick enough. This morning our bad luck continued. The Best Western advertised a full breakfast. While Jim showered, I went to the breakfast room for coffee. They were out of regular coffee and had only enough for two partial cups of decaf. When we returned for our meal, they were out of ham and eggs, and out of decaf coffee. About twenty minutes later they had eggs. Our luck changed as soon as we left the motel. We took Nevada 225 north to Idaho. The ride was spectacular. We wound through stunning country with canyons, rock formations, lakes, and a small river running alongside the road for a good thirty miles. This picture doesn’t do justice to the one hundred miles of spectacular scenery. I never thought I would be able to say this, but the Nevada scenery was great compared to what we encountered crossing into Idaho. Nevada 225 ended and we were now on Idaho 51. The next hundred plus miles resembled what you see in the background, with one exception. We passed maybe a half dozen farms, nothing else but open range. Leaving Elko we went 180 miles without slowing for traffic. We were passed by two pickups, we didn’t pass any one. D.E.E.R. were visible twice. Two were seen about three hundred yards off the roadway. The other was road kill. Most of the terrain was open range, cattle roamed free, no fences. We saw one steer about ten feet off the roadway and a dead calf just off the pavement. Idaho 51 offered no photo opportunities. I have to admit that Nevada 225 was worth the ride, even with the next hundred miles of boredom. Boredom is the wrong word, no ride is ever truly boring. 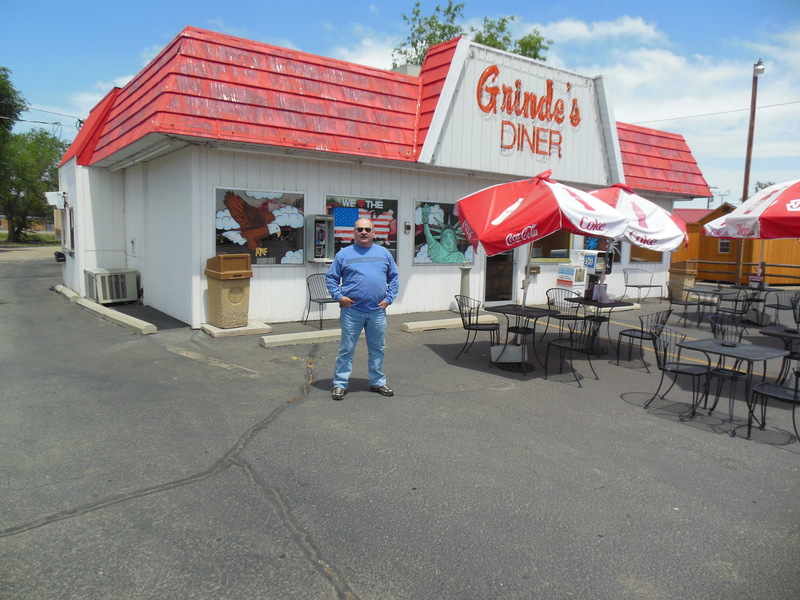 We stopped Grinde’s in Mountain Home, Idaho for lunch. The waitress, Barbara, was a pleasure. She welcomed us with a bright smile that filled her face. After she made sure there were no tomatoes in the chili, we ordered chili cheese burgers smothered with onions. For potatoes Barbara recommended chip fries, sliced potatoes cooked like American Fries. Jim and I took her advice, the chips were great. Our next stop was High Desert Harley Davidson in Meridian, just west of Boise. Another young woman, McKenzie, welcomed us with a great smile. Her folks are in public safety. She is following in their footsteps, studying Criminal Justice at the University of Idaho. Besides being nice, she was generous, giving us a 10% discount. That helped ease the pain for me. 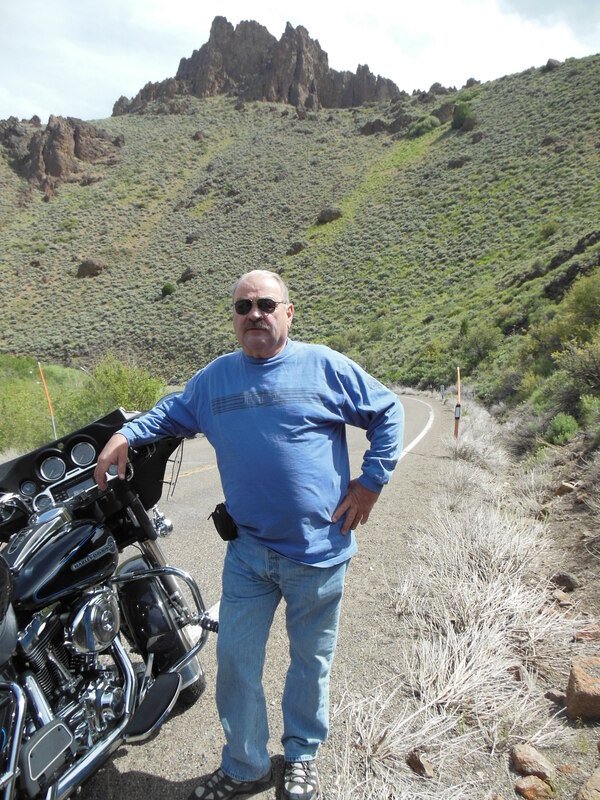 I bought the obligatory T-Shirt which was $39.00, highway robbery at High Desert Harley. Finished at the Harley store, we wanted to ride another hour before calling it a day. An Air Force and police department retiree pulled in while we were getting ready to roll. He and his wife had just finished a ride down through Colorado and New Mexico with a stop at Four-Corners. Jim explained our dilemma, “We don’t know which direction to go, left or right.” He suggested heading north and stopping at Horseshoe Bend. I’m glad he did. It proved to be a good ending to the day’s 280 mile ride. It also renewed my faith in Idaho. We doubled back to Kits Riverside Restaurant. Jon Kit came out to meet us. He was wearing a tool belt and was covered with dust, possibly sawdust. “We’re closed on Tuesdays so I can’t feed you tonight, but we’ll have a great breakfast for you in the morning. We open at seven.” The only room finished and ready for occupancy is really a studio apartment with a loft. $65 and we were in hog heaven. The deck overlooks the Payette River. The view is better than a similar one we had last year in the Cascades, but at less than half the cost. From the smile on Jim’s face, you can see we had a bodacious ending to a splendid day. Tomorrow I have to work for a few hours before we head for???? Sounds like you’re eating really healthy!